One of the problems the beleaguered choirmaster faces in today’s world is the lack of attention span on the part of Catholics in the pews (and even choristers! ), perhaps due to our modern obsession with television, iPhones, internet, etc. In the “solution” presented below, I cannot emphasize enough that the key to success is variation (organ accompaniment vs. a cappella, metrical hymns vs. chant, etc.) and especially alternation between priest, deacon, choir, congregation, and organist. The below model is able to be implemented with great success in the “typical” parish. It will be noticed that the pieces are very short in length, but ought to be done extremely well. It is better to do brief music beautifully than to attempt long, complicated music and do it poorly. It will be noticed that there is very little Latin (as this can be intimidating). 1. Immediately before Mass begins, a Hymn with organ accompaniment is sung in its entirety. Singing only a few verses of a hymn destroys its inherent poetry and frustrates parishioners, who have gone to the trouble of taking out the books and finding the correct page only to stop singing after the second or third verse. Since parishioners are accustomed to singing an opening hymn, taking it away would cause a needless rupture. Professor László Dobszay notes that singing a hymn immediately before Mass is the practice in many countries (page 24) and this practice serves as a nice “signal” to the congregation that Mass is about to begin. The Vatican II Hymnal is organized in a way that makes it very easy to choose hymns appropriate for each part of the Mass: not only does it have headers on each page giving suggestions, but the indices are also quite comprehensive and helpful in this regard. Best of all, 100% of the organ harmonizations, SATB settings, and cantor scores are available free online. 2. As the priest processes to and then incenses the altar, the Mass Proper is sung a cappella. As a reminder, the Mass Proper (in this case, the “introit” or “entrance chant”) is the ancient prayer, carefully chosen and assigned attached to each individual feast by the Church over a period many centuries. It can be sung in many ways (Latin or English), but one way would be the Simple English Propers. Incidentally, many large basilicas and cathedrals have sufficient time during the procession for an entrance hymn and the Mass Proper, a practice recently affirmed as correct by the USCCB Secretariat of Divine Worship (2/14/2012). The Vatican II Hymnal is the only hymnal to print the complete Mass Propers (in English with Latin incipit) as well as all the Mass readings, and this was done without a single page turn, so the congregation has no trouble praying along with the choir or lector. 3. The congregation sings the responses a cappella as the priest sings, “In the name of the Father,” etc. Throughout the entire Mass, all the dialogues between priest & congregation should be sung. For instance, after the Gloria, the priest should sing “The Lord be with you,” as well as the Collect. The melodies for the orations are very simple, within the capabilities of any priest. 4. The cantor sings “Kýrie, eléison” a cappella to a simple chant, the congegation repeats, then a 20-second polyphonic verset is sung by the choir. The same arrangement follows for the “Christe” and final “Kyrie.” There are hundreds of possibilities for this, but the SATB Brudieu Kyrie would be a fine example. 5. The entire congregation sings a simple, short, beautiful, chant-inspired setting of the “Glory to God” in English (with organ accompaniment). The piece is intoned by the priest, and the rest of the piece can be divided up into sections (a traditional practice). For instance, the women in the choir could sing the odd sections and the entire congregation could sing the even sections. The Gloria in honor of St. Edmund Arrowsmith would fit the bill quite well, it being brief, modal, and singable. The Vatican II Hymnal also contains more than 100 pages of other possibilities. 6. The Responsorial Psalm is sung (with organ accompaniment) to a beautiful, memorable, simple, singable, noble melody based on Gregorian chant. 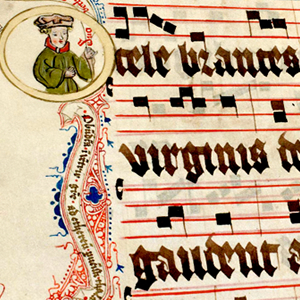 More than 2,000 are available for free on the St. Noël Chabanel Responsorial Psalms website. 7. The Gospel acclamation is done the same way, and could come from the St. Charles Garnier website. The Vatican II Hymnal contains the complete Chabanel Psalms and Garnier Gospel Acclamations in the same exact place as the Mass readings and Propers, to allow for maximum participation on their part. 8. The Offertory Proper is sung a cappella by the choir, and (as always with Propers) employs as many Psalm verses as are necessary to cover what is happening at the Altar. We have found that the Simple English Propers work very well here. 9. The Preface ought to be sung by the priest. 10. The Sanctus, Mystery of Faith, and Great Amen are sung by everyone to simple chant-inspired melodies with organ accompaniment. The Mass in honor of St. Anne Line would work well. 11. The Our Father is sung with one of several beautiful organ accompaniments, to enhance this well-known and loved chant. As mentioned, all the organ harmonizations are free online. 12. The Agnus Dei is sung in Latin a cappella, intoned by the cantor each time, and continued by the congregation. The final three words (“Dona nobis pacem” or “Grant us peace”) are sung in polyphony. This is very similar to the Kyrie (the polyphony can even be the same), but not as long. 13. The Communion Proper is sung to a simple English melody (the Simple English Psalm tones would work well) before the choir receives Communion. There is very little time, but the Communion Proper literally takes less than 10 seconds when sung with the Simple English Psalm tones. 14. As the Choir receives Communion, the organist plays an interlude (or a prelude based on the Communion Meditation if the melody is not familiar). 15. As the congregation receives Holy Communion, an a cappella Latin motet is sung by the choir. This should be sung to perfection, since polyphony ought never to be done in a “slipshod” manner. 16. After Communion, a congregational hymn is sung in its entirety (all the verses), accompanied by organ. The Communion Meditation is the only time the G.I.R.M. uses the word “hymnus” to describe what should be sung during Mass. The G.I.R.M. seems to favor congregational singing at this time, and my experience has been that it works much better for the congregation to sing at this point, rather than during the reception of Holy Communion. Distributione Communionis expleta, pro opportunitate sacerdos et fideles per aliquod temporis spatium secreto orant. Si placet, etiam psalmus vel aliud laudis canticum vel hymnus a tota congregatione persolvi potest. “When the distribution of Communion is over, if appropriate, the Priest and faithful pray quietly for some time. If desired, a Psalm or other canticle of praise or a hymn may also be sung by the whole congregation.” (2011 edition, General Instruction for the Roman Missal, §88) My experience has been that placing a hymn here is absolutely fantastic: everyone sings with gusto, and the all the verses can be sung. I have not figured out why people are so willing to sing after Holy Communion, but so hesitant to sing during the actual distribution of Communion. There is a temptation to do a different hymn each week as a Communion Meditation, but from a pastoral perspective this can be too much. A normal person enjoys hearing and singing a familiar tune: such a person is not bored if the tune be repeated twice monthly. The Vatican II Hymnal makes it extremely easy to choose a Communion meditation piece, as it contains more than 100 Communion hymns. Today, for instance, there were no fewer than three different choices for the feast of the Ascension: all of them beautiful, singable, fresh, with wonderful texts. 17. At the end of Mass, a hymn is sung by the congregation with organ accompaniment. Obviously, the above model is not “set in stone.” For example, the organist could play an interlude during the Offertory. The Gradual or Tract could be sung instead of the Responsorial Psalm. The traditional Introit could be sung in Latin, or employ an even simple arrangement (such as the Simple English Psalm Tones). But the beauty of the above recommendation is that it balances the liturgical music at Mass in a very pastoral way.